Anime aficionados mourned when Studio Ghibli closed up shop a few years ago, following the retirement of founder/legend Hayao Miyazaki. As it turned out, Miyazaki left the game for about as long as Steven Soderbergh did; his next feature is already in production (though probably at least two years away from release; animation moves slowly). Even had he stayed dormant, though, there was little cause for concern. Several Ghibli animators immediately formed another company, Studio Ponoc (named after the Serbo-Croatian word for “midnight”—a new day begins, metaphorically speaking), and clearly intend to carry on their former employers’ tradition. 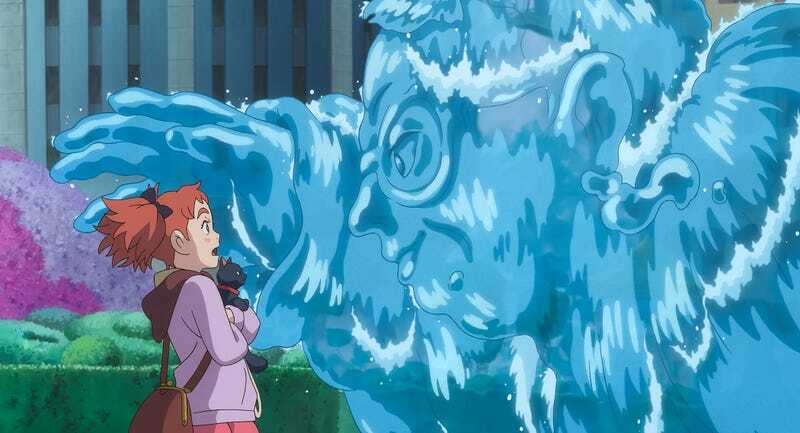 Their first effort, Mary And The Witch’s Flower, is all but indistinguishable from the films that its director, Hiromasa Yonebayashi, made at Ghibli: The Secret World Of Arrietty and When Marnie Was There. In other words, it’s sort of Ghibli Lite—not as transporting as the best work of Miyazaki or his co-founder, Isao Takahata, but a gently refreshing change from the hectic plasticity that now dominates Hollywood computer animation, and even from most other anime. Yonebayashi apparently loves children’s books written by English women, which have provided the source material for all three of his features to date. Adapted from Mary Stewart’s 1971 novel The Little Broomstick, Mary And The Witch’s Flower takes place in some unspecified rural area on the outskirts of a forest, where Mary (voiced by Ruby Barnhill in the English dubbed version) whiles away one boring day after another with her great-aunt Charlotte (Lynda Baron) while waiting for school to start and her parents to arrive. Mary’s adventure begins when she follows a neighbor’s cat into the forest and finds a miniature broom hidden amongst the trees, along with some unusually colored flowers. The flowers turn out to be magic, the broom springs to life (in a less threatening way than Mickey Mouse had to cope with), and Mary soon finds herself at the Endor School for witches and warlocks, where the headmistress (Kate Winslet) and a mad scientist (Jim Broadbent) mistake her for their newest pupil. “Trespassers will be transformed,” a sign at the entrance warns. “Say, have you ever perhaps seen Island Of Lost Souls?” it might well have added. 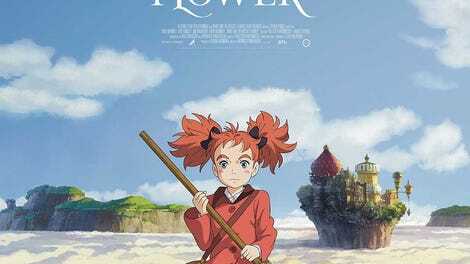 Actually, many elements of Mary And The Witch’s Flower feel slightly secondhand, though the most prominent—Endor’s similarity to Hogwarts—is purely coincidental. (Either that or it works the other way, with Stewart’s book having influenced Rowling.) A little girl flying around on a broomstick with a black cat recalls Miyazaki’s classic Kiki’s Delivery Service (1989), and the creature design in scenes involving animals that have been transformed into… other things will look mighty familiar to longtime Ghibli fans. Not every film needs to be groundbreaking, though, and serving up the cinematic equivalent of comfort food is probably sound strategy for a new studio positioning itself as Ghibli’s heir. Mary squarely hits all of its marks, fashioning a spunky young hero (Barnhill’s precocious volubility serves her much better here, as a voice only, than it did in The BFG) and alternately surrounding her with gorgeous watercolor landscapes and eye-popping grotesques. It’s a movie with no greater ambition than to charm and occasionally delight. Mission accomplished.